Trying To Get Some Color In My Life....Not! Yes, it's another of Marcy Tilton's V8709 now sadly out of print. I make this all the time, it's so versatile and really works for me. 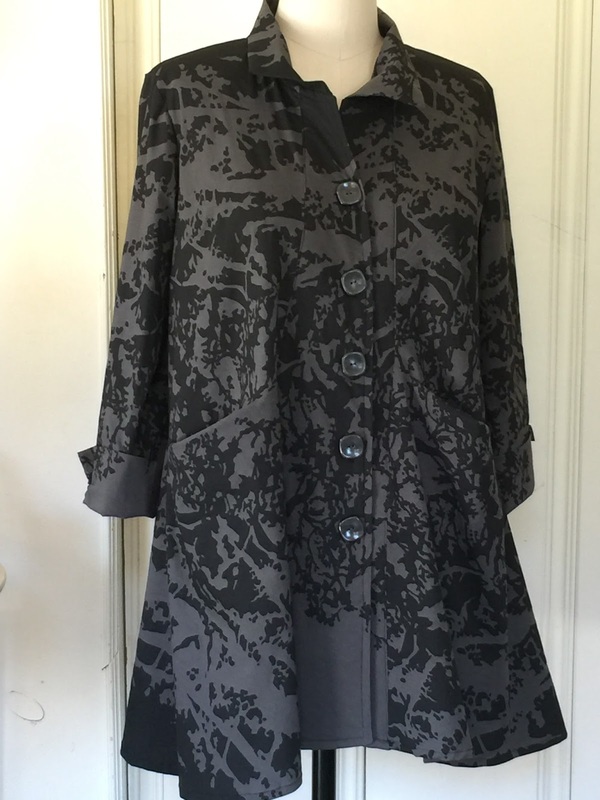 This is made from a lightweight stretch cotton from Marcy's collection. It's 3/4 length so can be worn with skinny pants or leggings, or a long skirt. 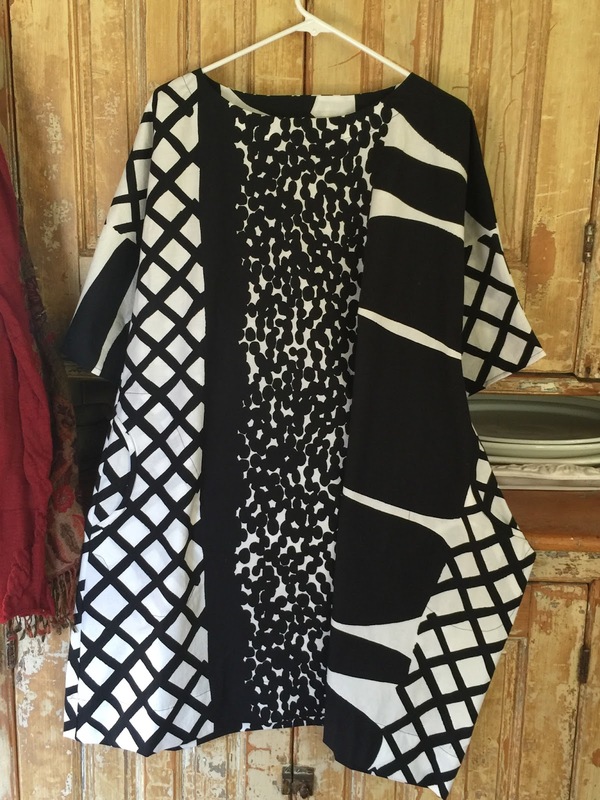 Here's a fun tunic/dress from a top pattern that I lengthened. Fabric from Marcy again. One side is straight and the other has an angular whoop-di-do. It hangs closer to the body on me but does have some pouf to it. I'll wear it with black or white leggings. I added this little pocket that is easy for my hands to slip into. Much easier than an inseam side pocket. 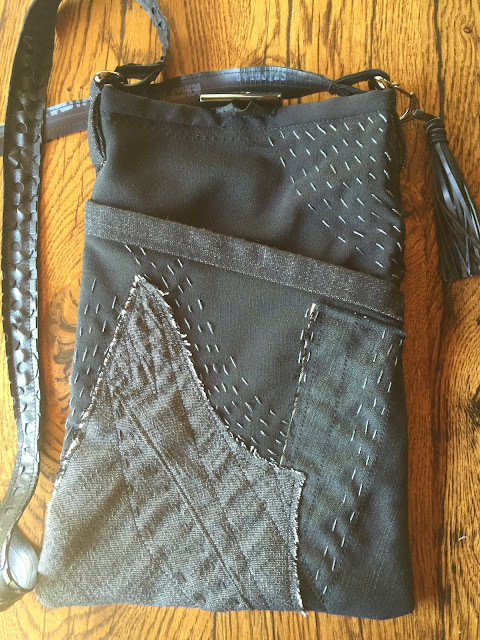 Does anyone know the name of this type of pocket? 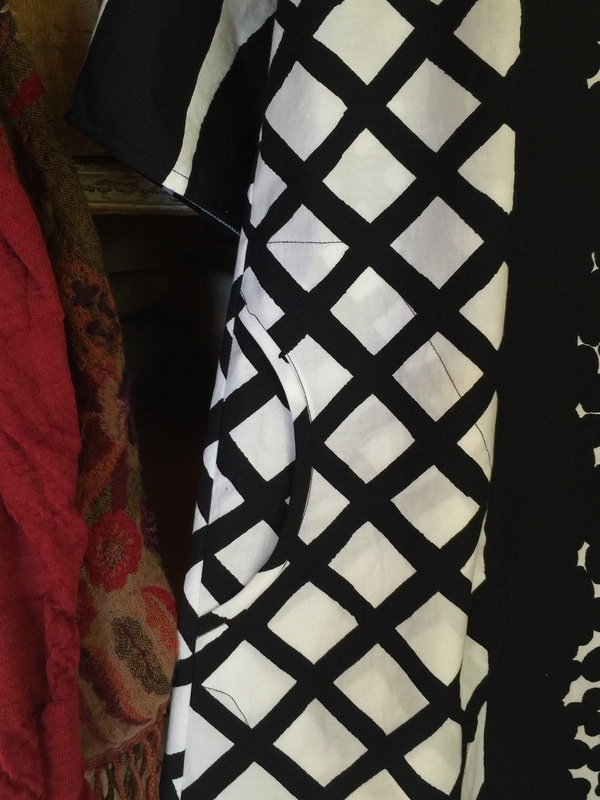 Shams, I'm talkin' to you, girl...your the pro at knowing the answer to most sewing questions! 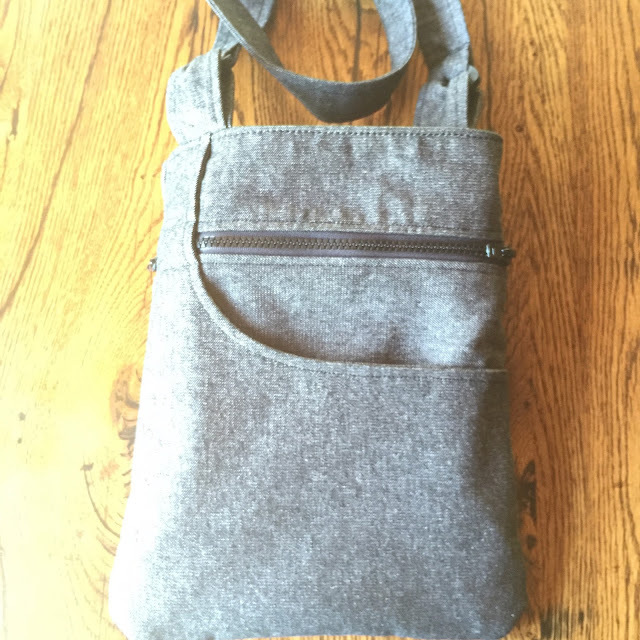 I've been trying my hand at making cross body purses that I use while traveling. This one is made entirely of scraps and stuff I had. I didn't use a pattern. I think there's more stitching that needs to go on the large grey shape to the lower left, I'm thinking in black, maybe a couple of concentric circles. The straps are bicycle inner tubes sewn to a laser cut vegan leather I got a couple of years ago. I haven't been able to figure out how to use it up until now and realize it needs to be used homeopathically. Here is the back of the same bag, using more of the laser cut vegan leather. The tassle is made from the bicycle inner tube. The jury is out on this bag. I'll wear it a couple of times to see if it likes me. And here is the bag I just finished. It's from an Etsy pattern from the shop called SaGranny but I don't think she is carrying it anymore. 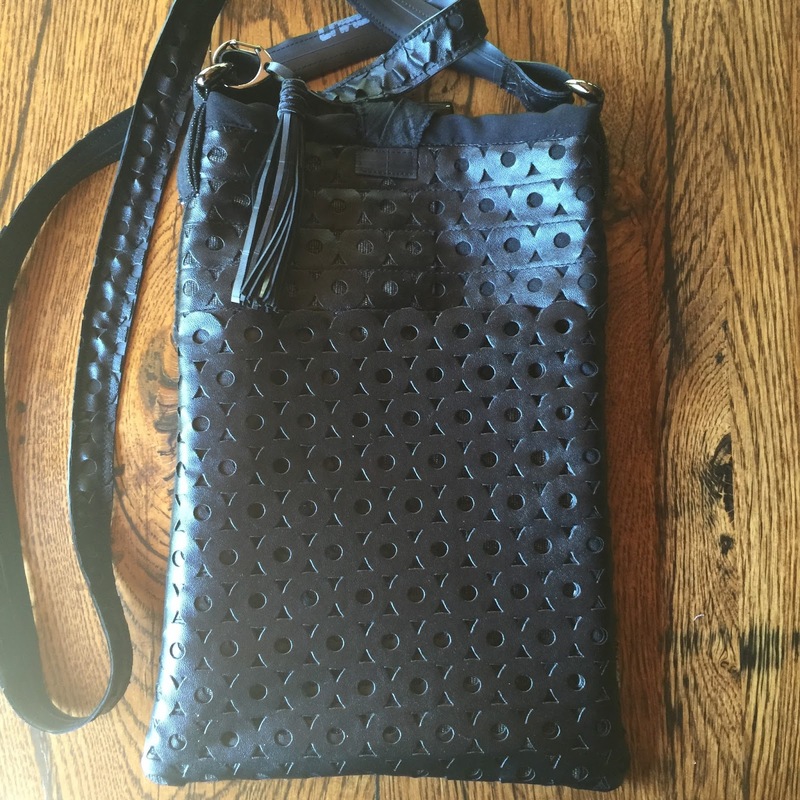 The designer is Ginnie Kelly and the bag is called A Cute Bag. I saw it on Pinterest and tracked it down. The pattern is challenging but fun and went together pretty well except I must have read the instructions wrong because the outer zippered compartments open onto the lining! Oops, I'll have to figure that out next time. Made this one of grey denim, should have used a thinner lining, too much bulk. But it's going with me to Oregon, Washington and Vancouver in a couple of days to be road tested.